As promised, my inspiration for this week is a lecture me and C attended a couple of weeks ago. It was given by Dr Prashant Kakoday who spoke about consciousness. As such, this is also a continuation of the post about the documentary concerning consciousness. 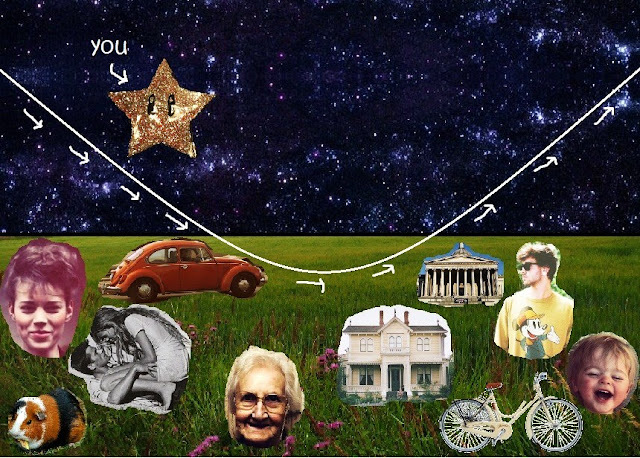 In this picture, you are the star. The black line is a division below which is this physical world and above which is everything else. The white line is your journey, showing how small and short this life is, and how all the things you consider yours in your life are simply things of this short visit, belonging only to a very limited physical world. With this, Kakoday wanted to highlight that the more we consider ourselves as guests, and the more we remember that we are the star, unattached to everything here, the more the position of our minds turn towards a healthier one, making us happy and balanced. This shift in posture does not mean that we need to give up everything, it will all still be there for us to use, love, and enjoy, and we can still buy things, but without the attachment and without the problems. So where to start? When someone in the audience asked this question, Kakoday simply said: as often as possible, simply think that you are only a guest, you are the star in the picture. Use this pattern of thought in your daily life, and if you want to go deeper, begin a daily routine of meditation.